stands for Menstrual Health and Endometriosis. is a well-health, placed-based secondary school education program. It’s unique, interactive, fun, informative and designed to fit with school curriculum. is age appropriate, embraces cultural and gender diversity to encourage and empower health seeking behaviours utilising various educational tools, teaching strategies and resources. 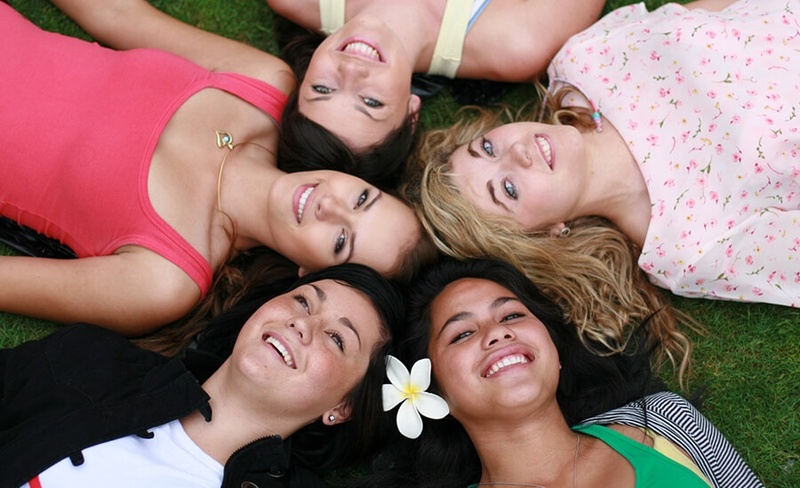 Endometriosis New Zealand has built strong relationships with secondary schools through delivering since 1995. The program is highly acclaimed, well audited and evaluated and recognised internationally. In 2007, was a finalist in the NZ Health Innovation Awards and received the Paul Newman Foundation Award. The programme is now published in ANZJOG (Australia New Zealand Journal of Obstetricians and Gynaecologists. The study, “Endometriosis education in schools: A New Zealand model examining the impact of an education program in schools on early recognition of symptoms suggesting endometriosis” by Bush. D., Brick. E., East, M C., Johnson N. (2017) is the first piece of literature globally which examines the outcome of a health education programme in schools and assesses whether it makes a difference. 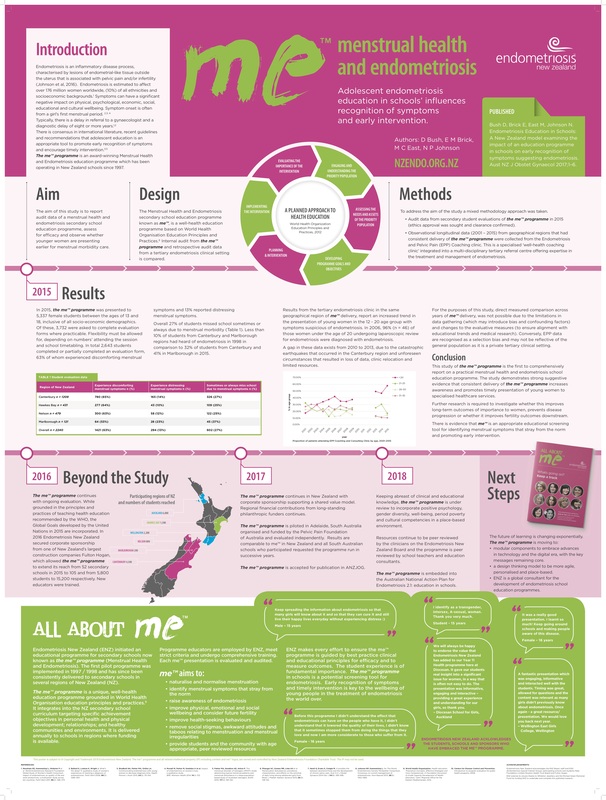 Scroll further down to view a poster prepared for international congresses. How long does the me presentation take? Approximately one 45 – 60 minute session to fit with your school timetable. can be adapted to suit other situations such as health days or assemblies. A projector for the powerpoint presentation. Speakers that connect to a laptop if available. Who is the me programme for? is suitable for students in years 10 – 13 (14 – 18 year olds). ENZ caters for everyone, and some co-ed schools opt to include male students. What about the school health curriculum? integrates into the following strands specifically targeting achievement objectives across a variety of levels. Endometriosis NZ actively seeks funding to deliver the programme, however ENZ is a charity and a koha (donation) to our organisation is appreciated. can be made available in any school throughout New Zealand. To organise in your school and find out about costs, contact the ENZ office. can be transported worldwide with resources and training made available. Take action for your school now. Adolescent endometriosis education in schools’ influences recognition of symptoms and early intervention.